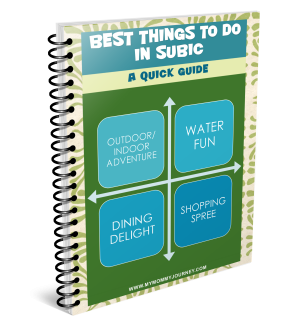 Where to stay in #Subic? Try the newest hotel in town! It’s Holy Week and hubby took Monday-Wednesday off from work so we can go on an early vacay. Lezzgo Subic! 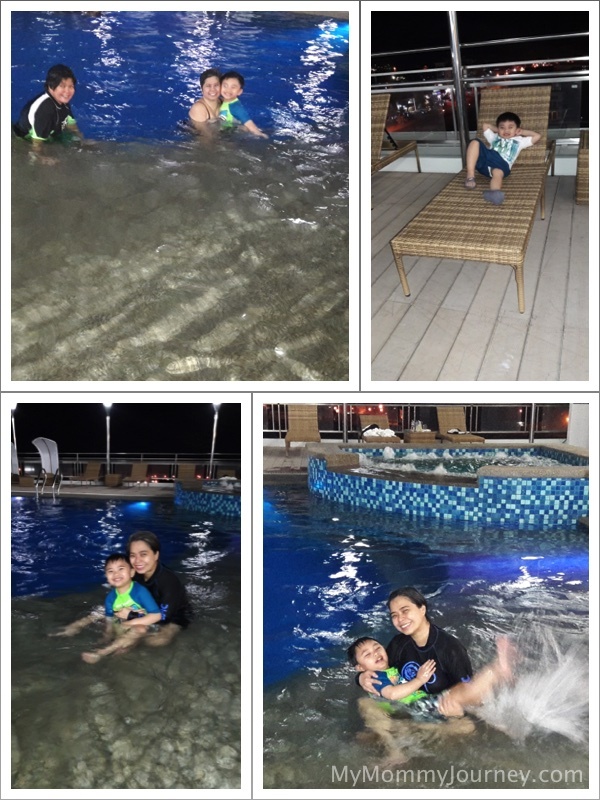 Our favorite beach resort was fully booked and the next best thing for my 3-year old son, Joshua, was to have a pool at the hotel. 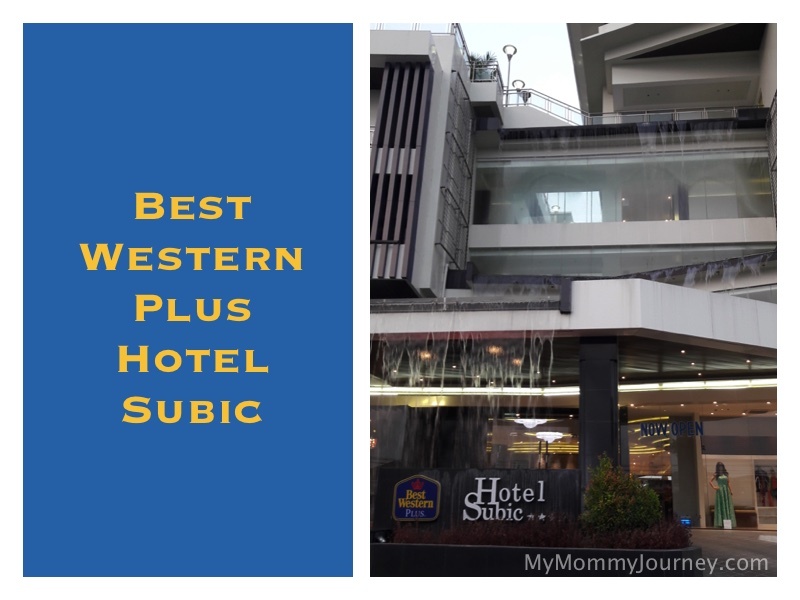 After searching thru my usual online booking companies and reading reviews, we opted for Best Western Plus Hotel Subic because it was the newest place in town. 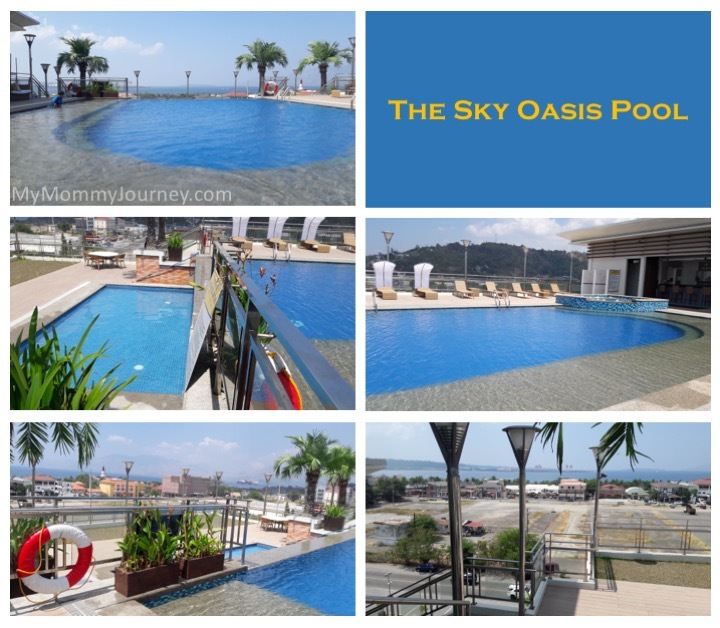 Plus it had an amazing infinity pool at the rooftop and free wifi. Luckily, I found a great deal on it thru a blog post. Off we go! Going to Subic usually takes 2.5-3 hours via NLEX and SCTEX. 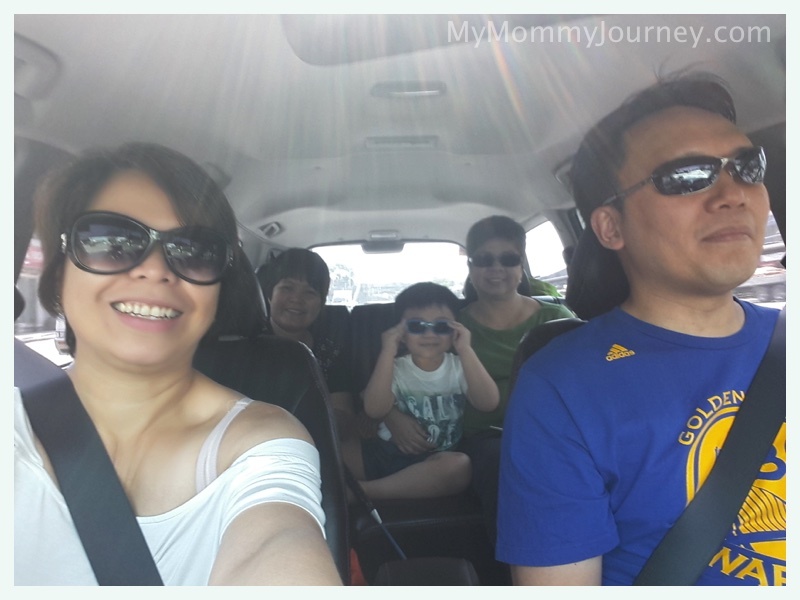 Since it was a Monday, traffic was very light and we reached Subic in just 2 hours. Wow! 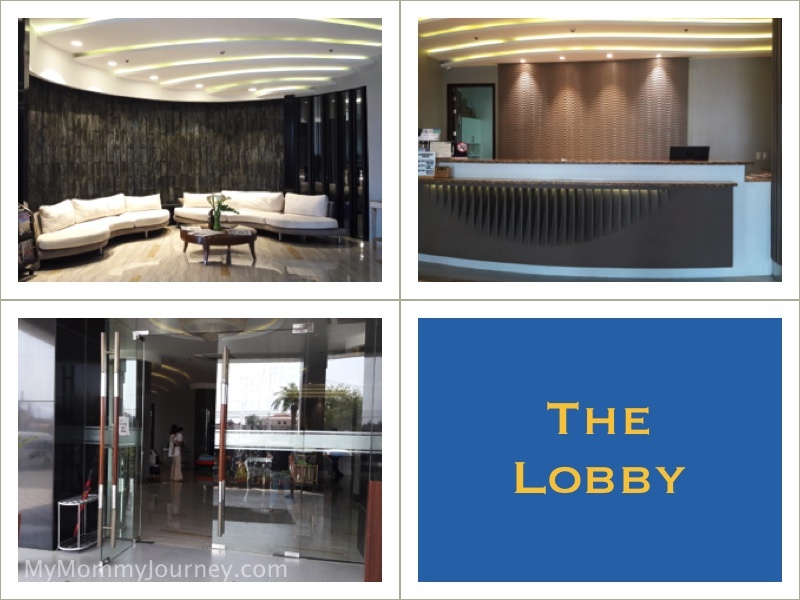 Best Western Plus Hotel Subic is on Dewey Ave, parallel to Waterfront Road. 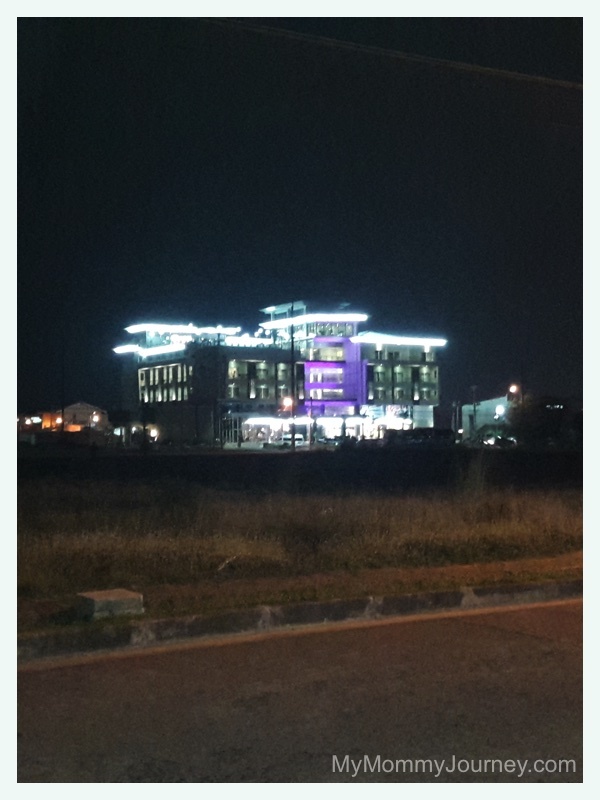 On the main Rizal Hiway, when you reach Harbor Point Mall, turn left on Sta. Rita Road. At the dead end, turn right, that’s already Dewey Ave.
You’ll pass by the San Roque Catholic Church and the popular Xtremely Xpresso Café. 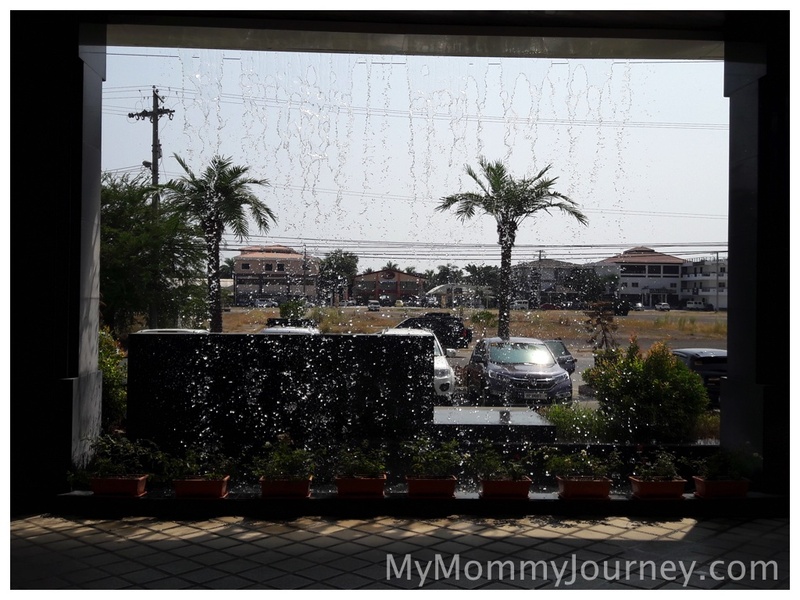 You’ll find Best Western Plus Hotel Subic at the corner of Manila Ave. You won’t miss it because it has a waterfall on its portico. We were immediately greeted and assisted at the hotel entrance. Our luggage was taken by the bellhop on trolleys. Hubby went off to park the car. There was ample parking space in front of the hotel so it was very convenient. The reception area was very bright and modern. It reminded me of some Hong Kong hotels in design. There was a lounge area with comfy sofas and waterfall trickling on the wall. My companions happily waited there while I checked us in. Check-in was a breeze! I wasn’t able to print out my booking voucher so I just gave the receptionist the confirmation number on my phone. She checked the computer and promptly gave me a room key card. I asked for an extra bed since my sister decided to come along and she said it would be arranged immediately. They didn’t even ask for a P2000 deposit as the usual practice of other hotels and they would just charge the extra bed upon check-out. I was surprised by how quick it all was. The bellhop came along for the elevator ride to our 3rd floor room. Good thing they did because they guided us how to get to our room through a different direction than what the signs said. 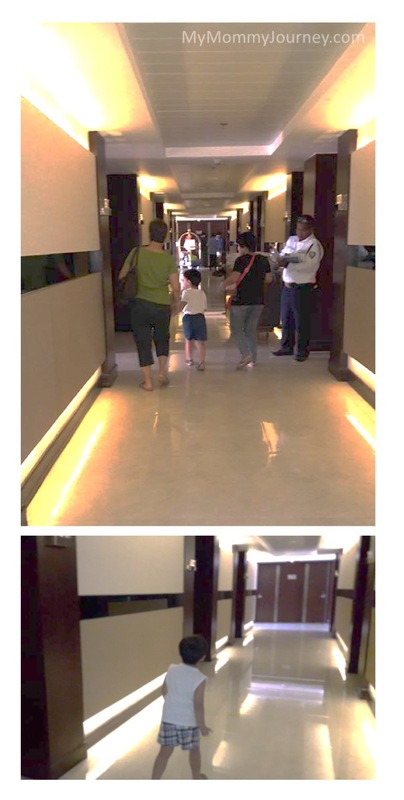 On the way to the room, you’ll pass by the corridor with full length-glass walls where the waterfalls outside flows. It was like walking under the waterfalls and Joshua had a blast. The room was really nice! It had a king size bed with a padded headboard. The pillows were really soft yet firm enough to support your head. The closet had quiet mirror sliding doors with an in-room safe, ironing board, slippers and bathrobes. The mini ref was hidden inside one of the doors. The closet had more cabinet doors and drawers than usual which was great to keep all our stash. The luggage table was connected to the closet and the desk. The desk had its own lamp and office chair. There was also a modern wing back chair to lounge in. There was a balcony beyond the full length windows which turned out to be sliding doors. It had outdoor armchairs and a table. It would be nice to have coffee or midnight snacks here but unfortunately, there was construction going in in the adjacent lot. 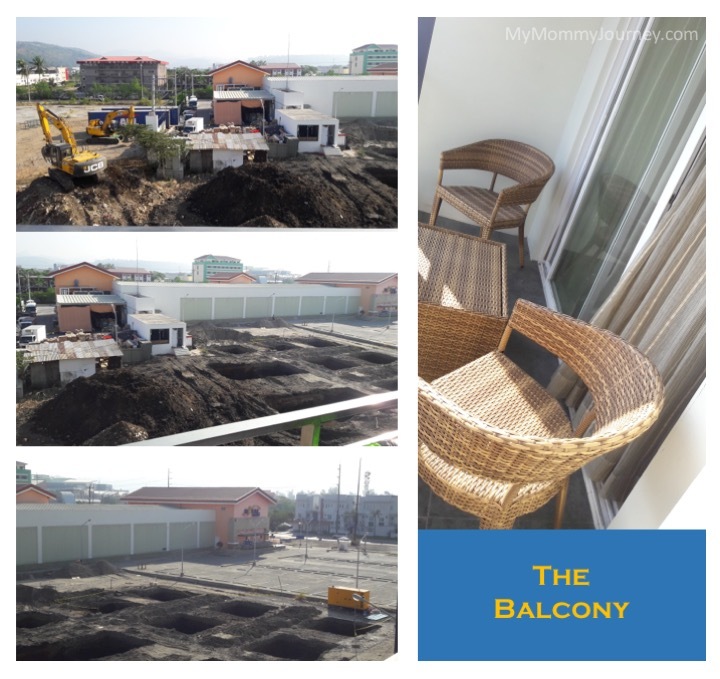 The Royal duty free grocery behind the hotel was doing an expansion so there were backhoes, dump trucks and a lot of dust so using the balcony was pretty much not advisable. We only used it to hang our wet bathing suits and towels. Maybe next time we stay here, construction of the adjacent lot would be finished and we could use the balcony. 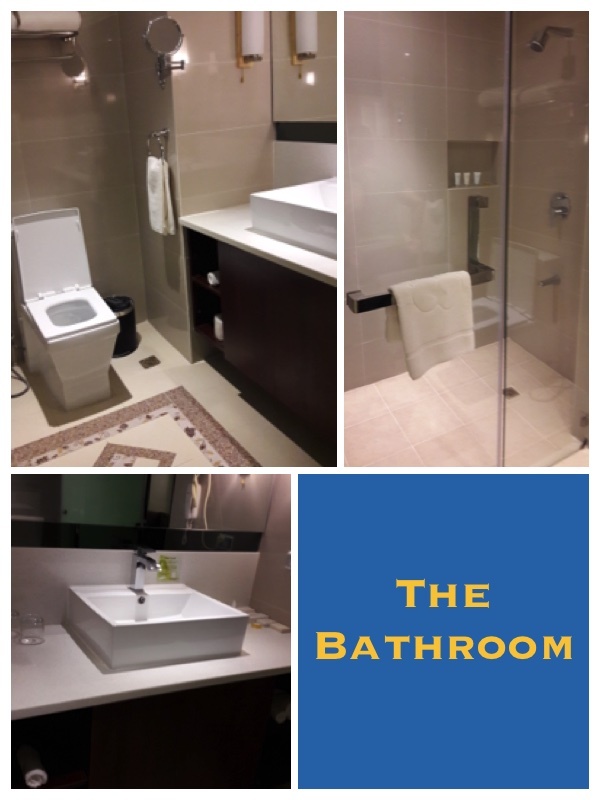 The bathroom can be accessed from the bed area and not the hallway. 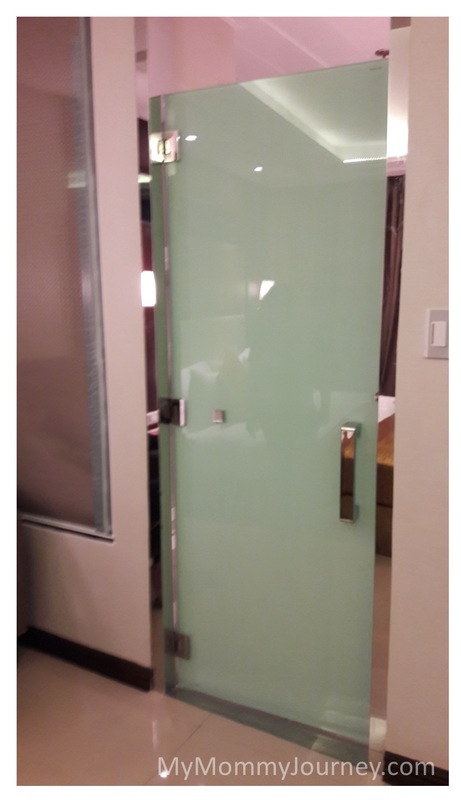 It had a frosted glass door that didn’t reach the top door frame which had a reflective chrome finish. This was a bit of a problem because each time you use the toilet, you are conscious that the others in the bedroom could hear and smell your business hehe. Plus the chrome finish of the door frame reflected you back inside the room. Not so appealing. The bathroom was very clean and modern in design. The toilet is square shaped and the lavatory was rectangular and sits on a granite vanity. It had open shelves where the hand towels and extra toilet paper was stashed. The usual hotel bathroom amenities were on the vanity as well. Loved their soap! The shampoo, conditioner and body wash were placed inside the shower. The shower area was huge! You could fit a really long bath tub in it. The end wall of the shower was made of glass because the room was really meant for couples. But they placed a roller shade to hide the shower from the bedroom view for privacy. Amazingly, they had 2 shower heads: a typical wall shower and a ceiling rainfall shower. You could opt to use either one or both at the same time. Cool! But not so cool for Joshua’s yaya (nanny), Ate Irene. 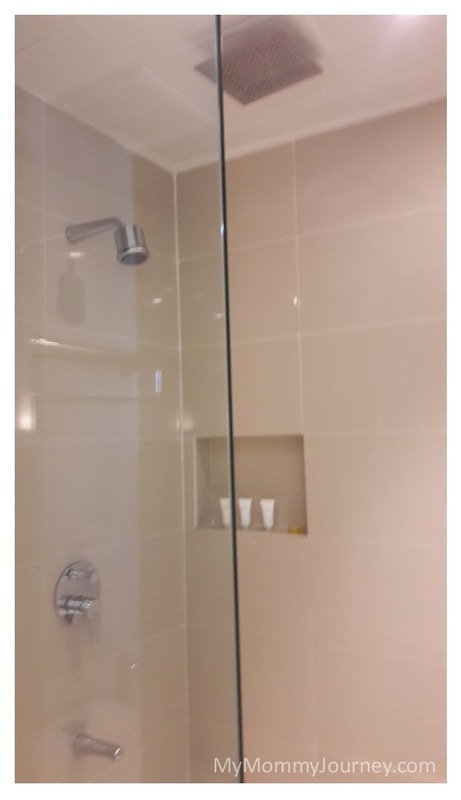 We didn’t notice that the shower had 2 shower heads yet. My sister, Banna, was the 1st to use the shower. She started telling us, “Uy yung shower pala dalawa and shower heads…” (Hey, you know the shower has 2 shower heads) when we heard a shout in the bathroom, “Aaaahhh!” Turns out Ate Irene was in the shower preparing a bath for Joshua when she inadvertently turned on the ceiling shower and got herself all wet… Fully clothed hahaha! Service was impeccable and deserving of the 4-star rating the hotel has. Aside from the efficiency of the bellhop and fast check-in at the reception, their housekeeping was also very quick to fulfill your requests. They set up the extra bed we asked for so fast. When you ask for something, they come and give it to you in less than 5 minutes. Wow! We requested for a pail and dipper because Joshua doesn’t like using the shower when bathing. We usually bring our own set when we travel but we thought the room had a tub so we left it at home. It was a challenge for them to find a dipper but within 5 minutes, both pail and dipper were there in the room. They’re also not stringent with pillow requests. There were already 4 pillows for 2 people plus 1 pillow for the extra bed we arranged for. When I asked, “Nakakahiya ba humingi ng 3 extra pillows? Pwede na din 2 pillows sige,” (Is it embarrassing to ask for 3 pillows? 2 pillows is ok) They still gave us the 3 pillows originally requested. No questions asked. Once I found a door open along the hallway. It was a King Executive Room and it was being repaired. I asked the worker if I could take a peek inside the room so I would know the difference between a Deluxe King (our room) and that room. He graciously let me go around and take pics. But he didn’t let me out of his sight for security reasons. I discovered that the only difference between this room and our Deluxe King Room was the bath tub. One other time I found the housekeeping cleaning up another room. I again asked to take a peek because it was a Deluxe Queen Room, the room we originally wanted to book. He let me go around and take pics. It had 2 Queen beds and was more spacious than the Deluxe King. Next time we’ll book this room! Overall, the staff were nice and friendly, always with a smile on their faces. They were very lenient with their guests and didn’t question every move you make. They were always quick to fulfill your needs and requests. They made you feel like royalty! The hotel has free wifi in all their rooms. The password was pasted in the room key card case. When we arrived, hubby couldn’t connect to it and called the Front Desk. Instead of asking us to go down, they sent someone up to our room to check the problem. They again came back with the solution: We were connecting to the wrong wifi (their offices) hence the password didn’t work. We appreciate their prompt service and the wifi signal was strong even inside the room. They had an infinity pool on the roof deck and it was gorgeous! It is outdoors so the view is amazing. The mountains to 1 side and the bay on the other side makes for a sunset viewing while swimming appealing. The wind was also brisk so if the water won’t cool you, the breeze certainly would. The pool is divided into 3 parts: Kiddie pool at the bottom, you go up some stairs and find the Adult pool and finally a bubbling Jacuzzi attached to it. We didn’t try the Kiddie pool because it was only knee deep. Joshua prefers the big pool which was 5 ft. deep. It also had an extended step along 2 sides of the pool which was ideal for sitting or in my son’s case, frolicking in the pool. The Jacuzzi attached to 1 corner of the big pool also had a step running around all around it for sitting. You can ask the pool attendant to turn the jets on for the bubbles. Although the water wasn’t warm, the bubbles were so relaxing that you would hardly notice it. The Bar area was off to 1 side of the pool. You could order drinks and sit in bar stools while watching on their huge LED TV. You could even watch TV while doing night swimming because it’s visible from the pool. The bar attendant was also the lifeguard so he’s always around, ever attentive to guests’ needs. You can also get your towels from the attendant at the Bar. He doesn’t even ask for your room number and let you bring them down to your room. They trust their guests that much. Outdoor open showers and a couple of toilets/changing rooms were off to either side of the Bar. 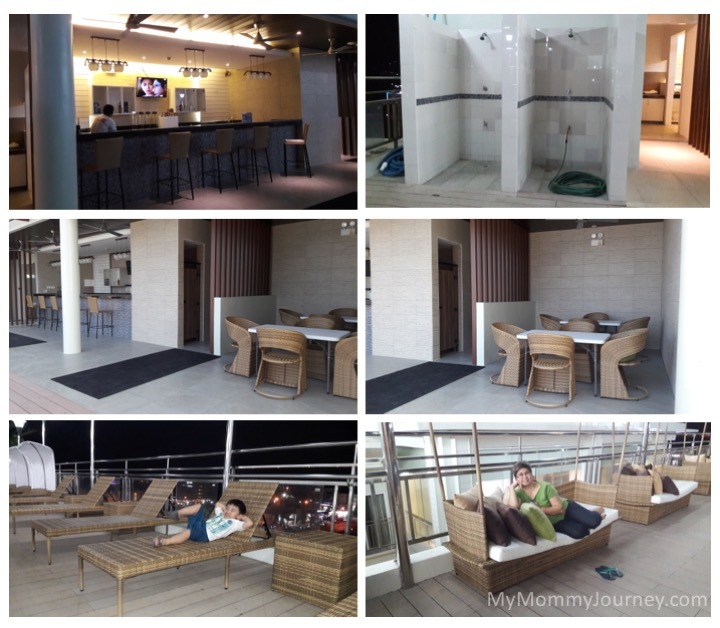 There were outdoor sofas with lots of pillows and sun loungers around the pool deck for lounging and sun bathing. There were also a few dining tables near the bar area. At first I thought you couldn’t bring up your own food. But when we had pizza and pasta delivered from Xtremely Xpresso one night, the pool attendant called the Front Desk to instruct the delivery guy to bring it up to the pool area. So we had our dinner under the stars by the pool. Cool! Swimming here is appealing both for adults and kids. The infinity pool is designed to look like an extension of the bay beyond. We tried both night swimming and morning swimming to see how it would feel like. Both were great experiences because the moon and stars at night while the bay view and mountains in the morning were great backdrops while you swim. Next time we’ll try sunset swimming! They had a gym a flight beyond the swimming pool. 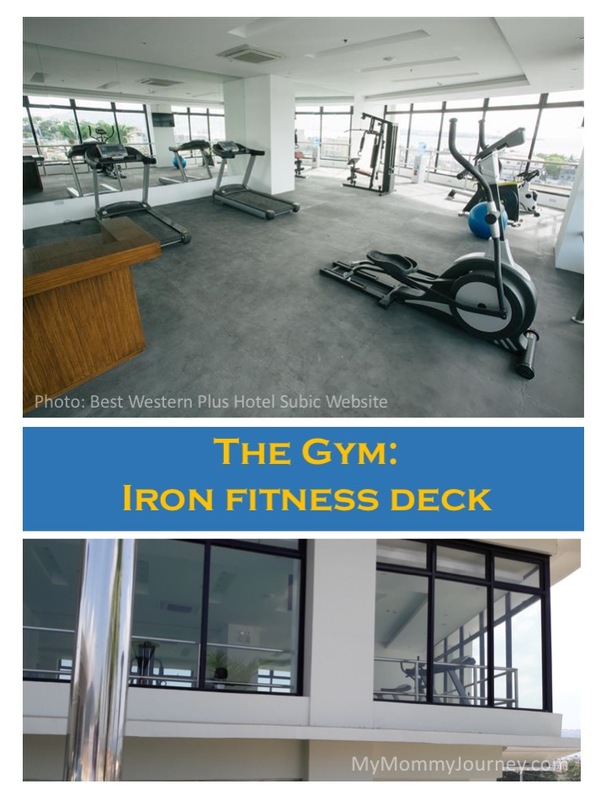 It’s small but had treadmills, ellipticals, rowing machine and weight machines. The full-length glass wall with the bay view is great while you sweat it out. They also had a TV if you prefer to watch your favorite program. Our stay had free breakfast for 2 people. The extra bed we arranged for also had free breakfast with it. 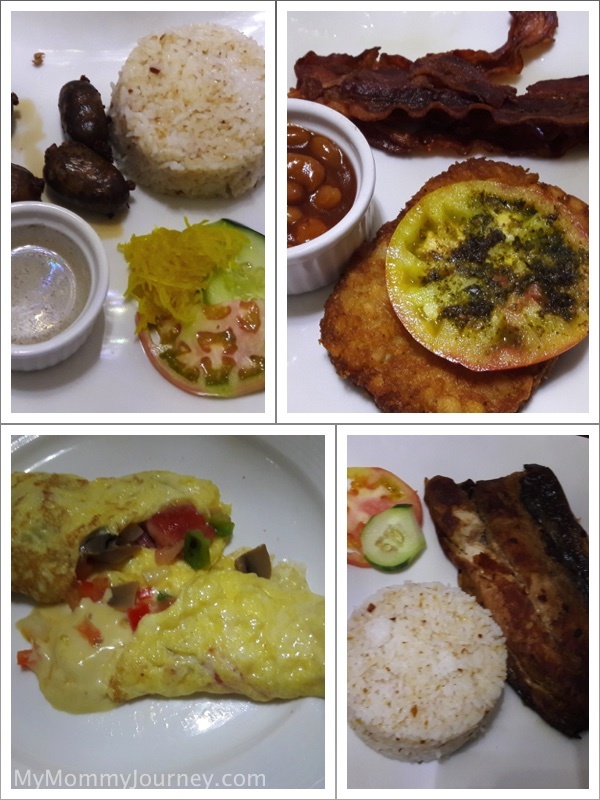 We thought it was a buffet breakfast but they said it depends on the number of guests currently staying. We were offered plated breakfast choices instead. 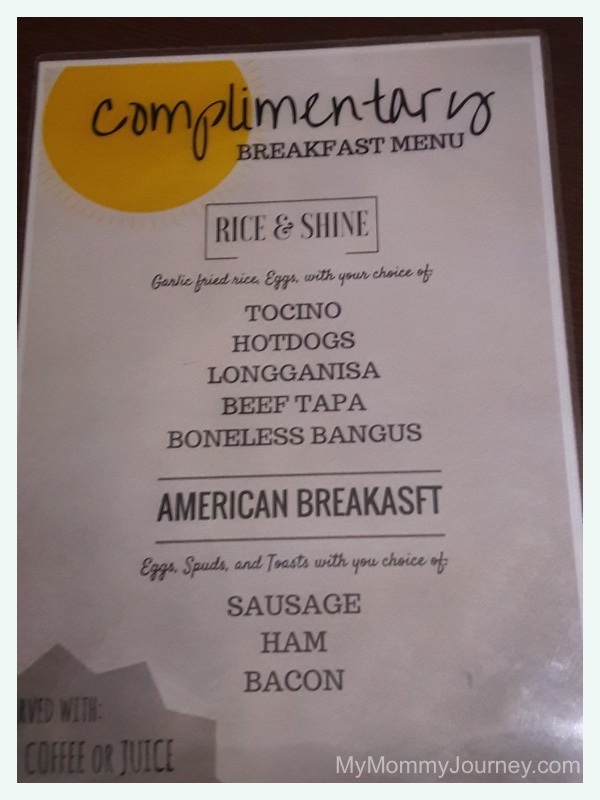 You can choose either rice meals or continental with toast. Both come with your choice of eggs. For drinks, you can choose coffee, chocolate or juice. Before you think it’s a rip off, we found the rice meals very filling and delicious. 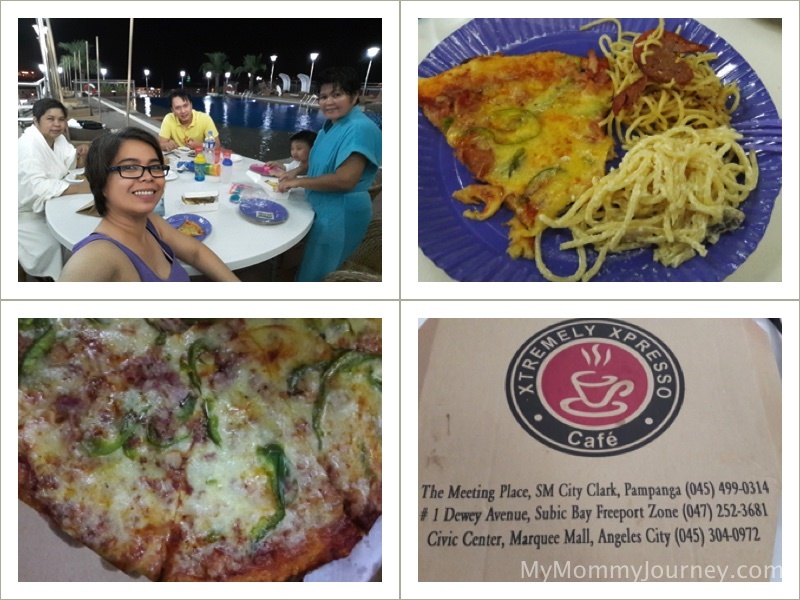 We tried the Vigan longganiza with sinangag and the boneless bangus was huge! We also tried the bacon with toast and when asked to make it crispier, they obliged. What we don’t know is if we can order another round of plated breakfast but one serving is enough. 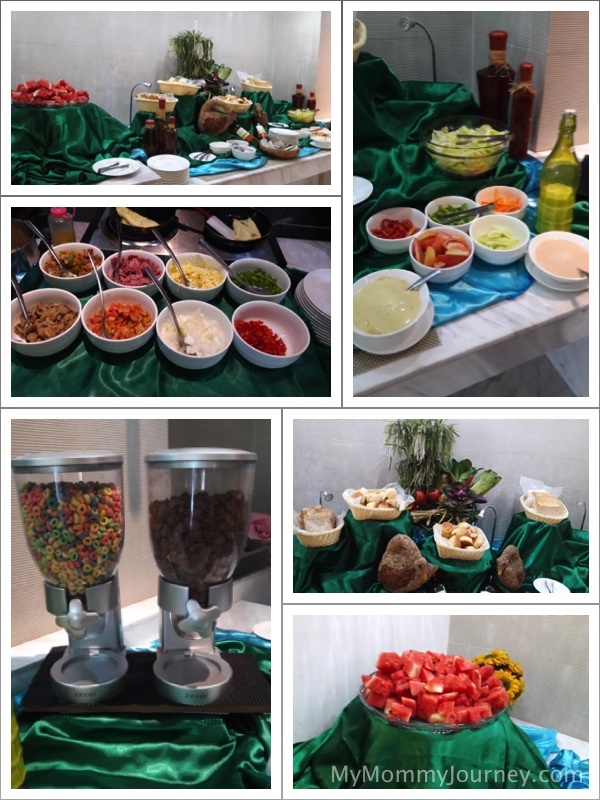 There was actually a buffet setup which has a variety of cereals, fruits, salad and breads. 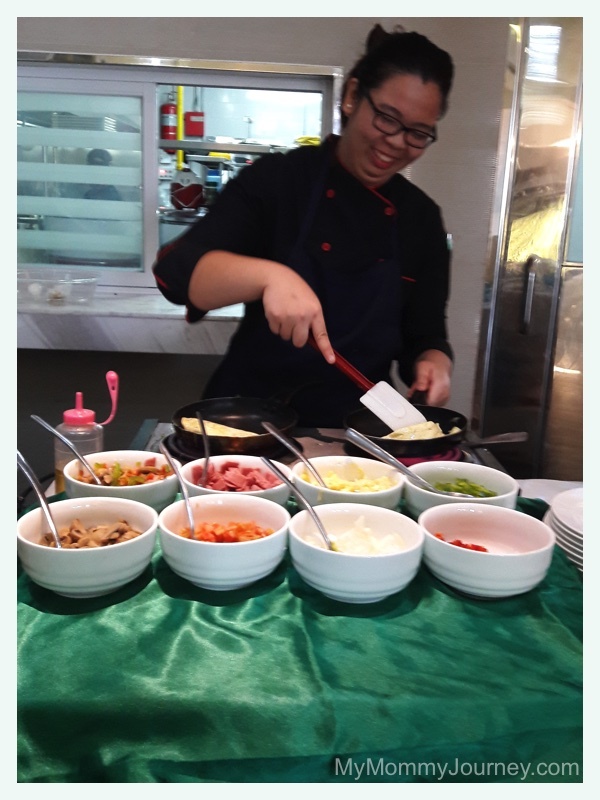 There is also an Egg Station where the chef will cook your eggs any sytle you want. This is where the egg part of the plated meal is ordered. The omelet is especially good with lots of ingredients to choose from. Service here was very efficient as well. The attendant is quick to respond when you raise your hand to call their attention. The plated meal was served quickly and they oblige if you want it cooked a certain way. Price wise, if you want a meal besides the free breakfast, the menu has the typical hotel prices. So we opted to eat out or have food delivery elsewhere. One thing I’d like to mention is their elevators. They were very fast and had a digital screen that advertises their different rooms. But what really stood out was the song playing each time you ride it. It was a lively instrumental song with a catchy tune. 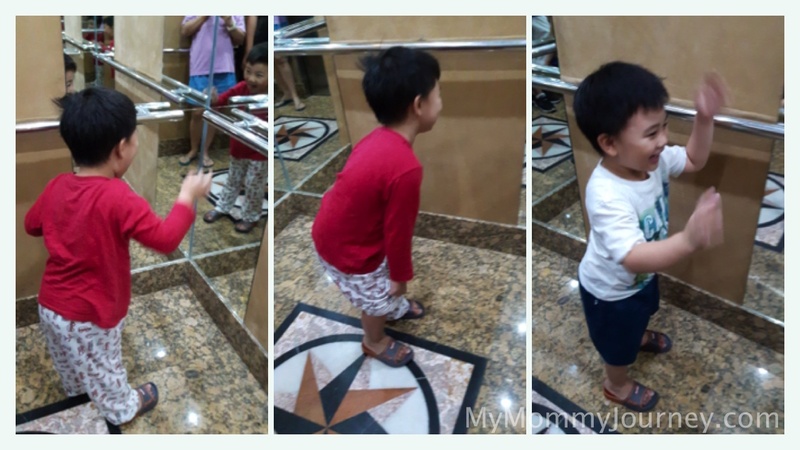 My son couldn’t resist and would always end up dancing in the elevator haha! He would face the mirrored wall and watch himself wiggle and dance to its tune. Funny! Same as the check-in experience, check-out was a breeze. They gave me the bill for the extra bed but mistakenly charged me for only 1 night’s use. I corrected them and they were grateful for my honesty. They assisted us in stowing our stuff in the car and with a big smile, waved us off. 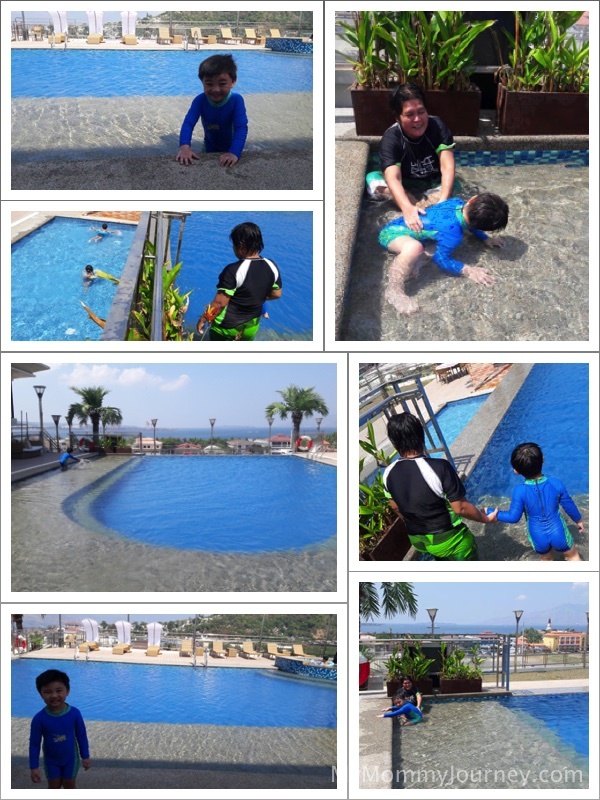 All in all, staying at Best Western Plus Hotel Subic was so worth it! We had a really great experience, everything was so new and clean and hope they keep up their great service. We will definitely stay here again! ♦♦♦♦ Service, Accommodations, Amenities , Food and Price! Search and research online when deciding on where to stay on your vacay. I usually use Agoda, Asiatravel and Tripadvisor for prices and reviews of places to stay. Also check out blogs because the author usually gives first hand information about the place you want to stay in. I discovered a great deal reading a blog review and used Travelbook for the 1st time. 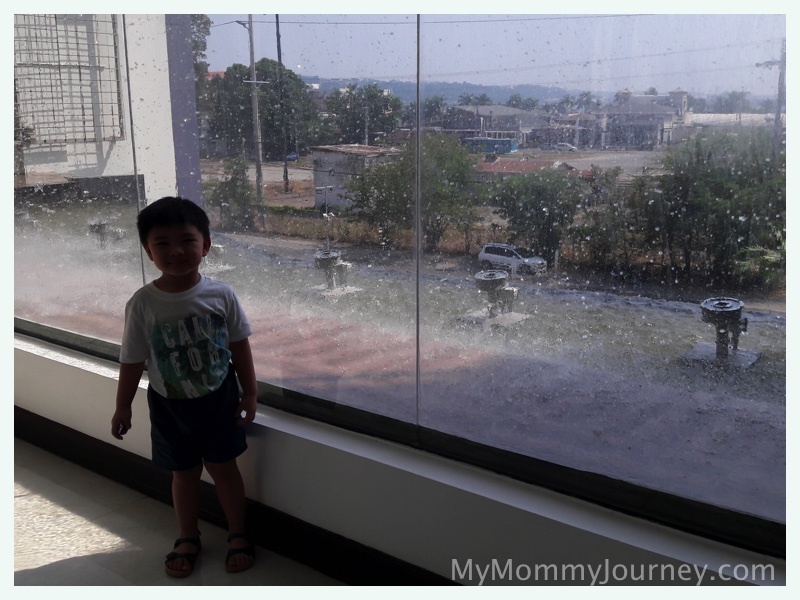 This sealed the deal for us to choose Best Western Plus Hotel Subic. 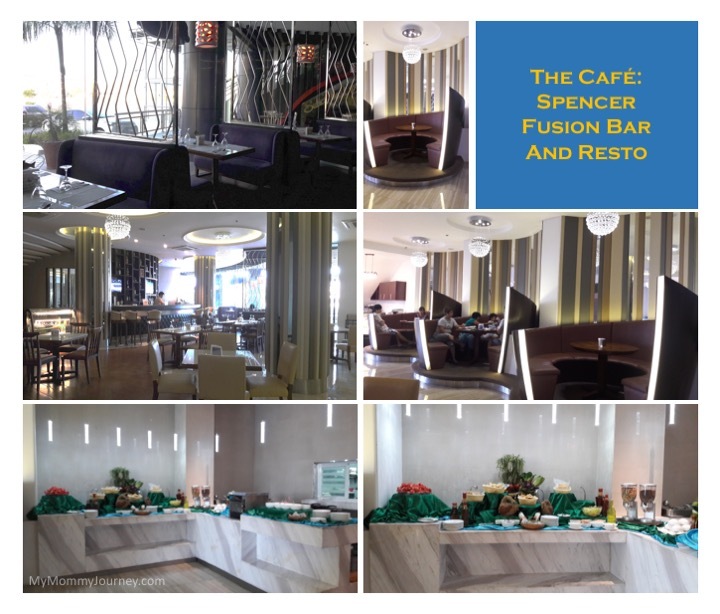 We made the right decision in choosing the newest hotel in Subic. Service was impeccable and the accommodations were very new and clean. The pool was fabulous and makes this hotel worth the stay. Although a bit pricier than the other older hotels, it was quite an experience to bask in its newness. Not being charged or questioned for every move you make is a welcome change, it makes you feel like royalty. We will definitely stay here again! 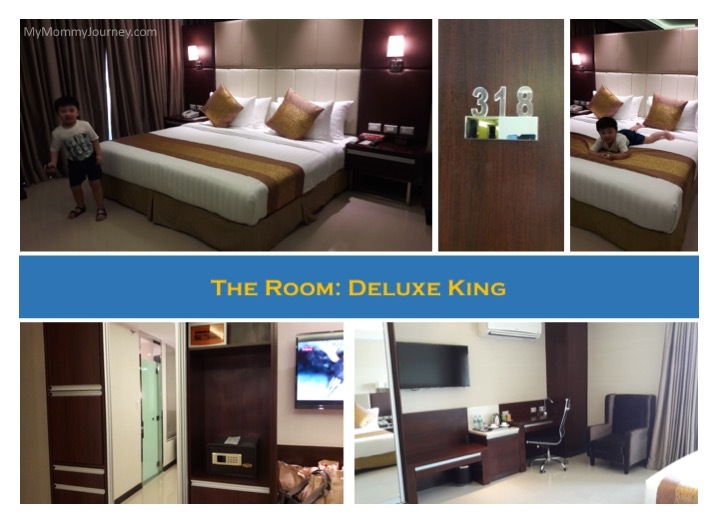 If going as a couple, the Deluxe King room is your best choice because of the luxurious king sized bed. 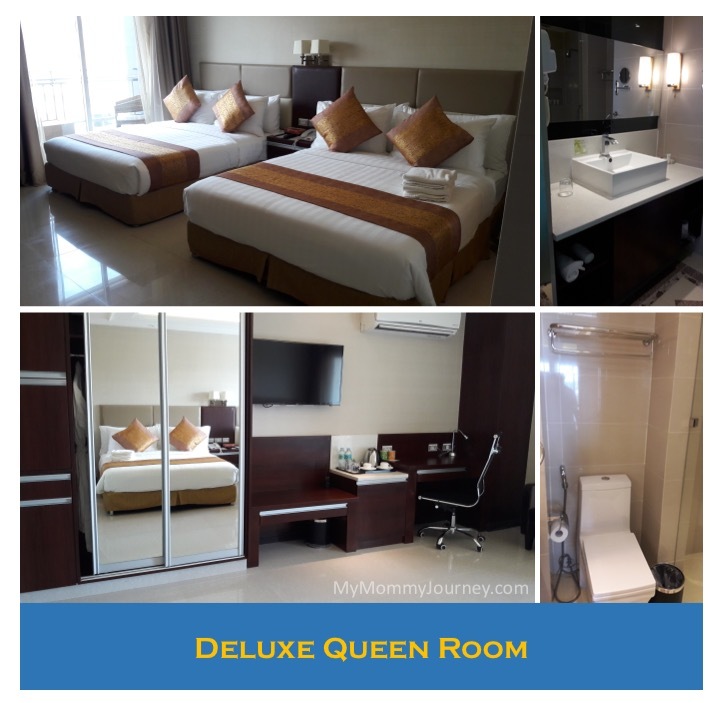 If going as a family, the Queen Deluxe room is a better choice as there are 2 queen beds and ample room. They also have a Family Room with 2 king size beds but is not usually found in the online booking sites. You’ll have to book this directly at the hotel’s website. If going on a budget, try their Value Plus room which has a queen size bed but smaller space. If you prefer a bath tub, choose the Executive King room. It also has a separate shower stall beside the tub. 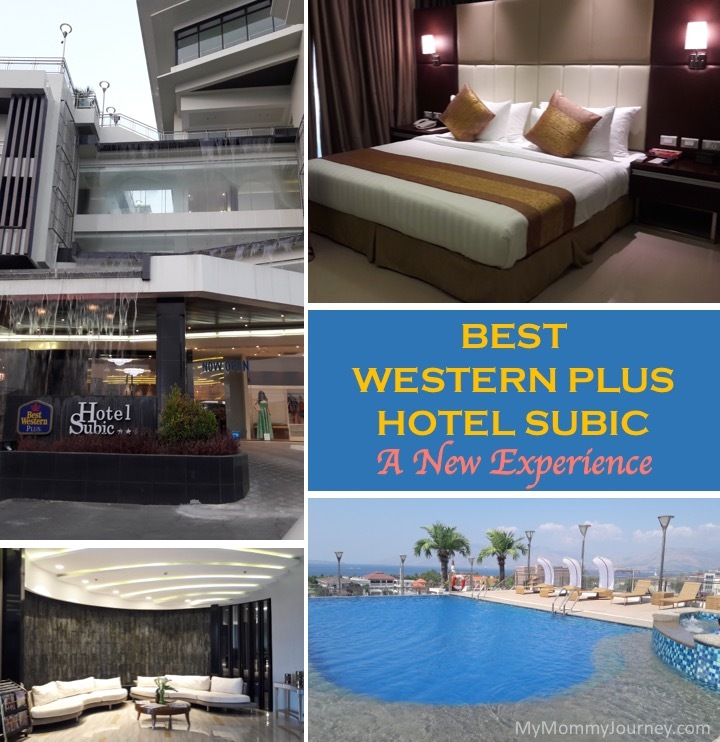 Best Western Plus Hotel Subic’s location is near enough the main Waterfront Drive yet far enough from the night action and noise. You can see the waterfront hotels and restaurants on the next block and hear some of the music coming from Pier One when you’re swimming at the roof deck. If you want some peace and quiet yet want the convenience of being close to the center of action, this is a good choice hotel. Everything is walking distance. 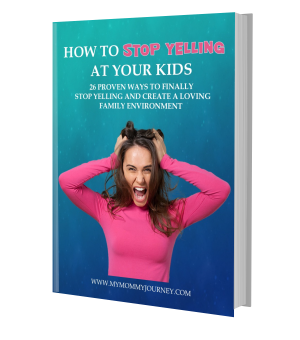 Be prepared with your travel paraphernalia especially when you have a kid with you. We made the mistake of assuming our hotel room had a bath tub and we didn’t bring Joshua’s pail and dipper. Good thing the hotel staff was resourceful enough to provide it for us. If traveling during Holy Week, consider going on days that are low peak like Monday-Wednesday. This way you won’t get caught in traffic and the place is not crowded. You’ll get to enjoy and relax more. When traveling, do you consider the price more than the amenities/accommodations and the experience? 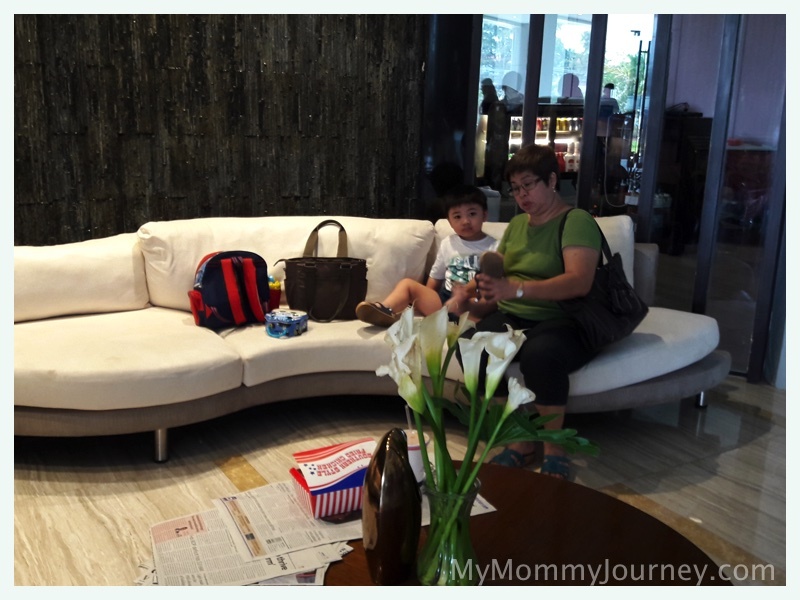 Do you know of other hotels in Subic that is kid-friendly?